It was a fairly quiet week and weekend over here at the Watters’ home, and it was much needed by all. After hosting our lovely Sobremesa gathering, and then having two weekends of family visiting in a row, first by my brother Shane and his girlfriend Caitlin from Denver, and then my parents the following weekend from Iowa, my soul needed a break. I love hosting, it’s always such a breath of fresh air to have those we love stay with us in our home, but it always takes a lot of energy from me as I give it my all, tending to everyone’s needs and trying to make those here comfortable and comforted as possible. I have learned that in addition to hosting, I need time spend hibernating alone in sync with a slower rhythm to recover. In that time, I scheduled a few new wellness pursuits to get me back on track in the spirit of self-love and wholeness. I joined Orange Theory with Andrew and have been going 4x a week to get into better shape and to feel more energized during the day. I had been feeling sluggish and this is helping me, despite my cynicism towards competitive workouts. And guess what, I feel my abs for the first time in years! They are under there, and they are on fire, so that’s motivating. I also made some spiritual wellness appointments that have offered me new perspectives and new insights on what it means to be alive in this beautifully messy world we share. So last week was full of a lot of personal growth, which for me, is always coupled with an inner retreat to sort things out and hold space for all that I’m learning and shifting. I find that when I rest and reset on a soul-level, I am able to restore my deepest reserves, which helps me recalibrate and realign my purpose as I move forward. It’s not really an intentional thing I do, but more so a pattern I’ve recognized within myself in that I truly need space and time to heal and sort. Contemplative time is essential for my personal growth, as “doing” instead of “being” tends to undo in more ways than I can keep up with. Along the thread of my spiritual wellness adventure, I’ve begun to dive deeper into the intimate waters of mindful mediation by really taking the time to listen to the song of my soul. It’s been a wonder-filled challenge for me, but worth every second. As someone who grew up Catholic but always felt like I didn’t belong to that community, I am relearning in my adult years the true difference between religion and spirituality, along with what it means to live out my truest calling and purpose. I have been going a 5-10 minute practice each day that I will share with you at some point, that centers all parts of my being. As someone who struggles with both anxiety and depression, it is helping me so much. I can see with greater clarity and find so much more inner peace after having taken just a few moments to connect with my inner-self through intentional grounding and awareness. Is meditation something you regularly practice? I hope to share more on this in January, but sometimes things are best left to oneself rather than be shared immediately with the world . I am learning this too – the beauty of holding sacred lessons close so I can better listen to the truths they hold. And speaking of January, who is up for another Rest Retreat?! I AM! More coming on this too, dear ones. Our communal sabbatical from the screen tenderly awaits! Us gals watched and snipped and folded and glued and bonded over a movie that continuities to make the hair on my arm stand straight up. “Only faith, poetry, love and romance, can push aside that curtain and view the beauty and the glory beyond.” Isn’t that the truth? I sat there on the couch nodding my head with a lump in my throat, tears brimming at the full circle I had made from a few days previous. What is real? The unseen world. Beauty. The heart of childhood. Glory. And beyond. It was a moment that made me grateful for this slower season of coming together, for winter, for watching old movies laced with nostalgia, and for Advent, in the quieting of our hearts so we can hear that which sings in the depths of our souls. You will have to head over to this post to see how to fold the stars but as for everything else, you really just need to take a glance at the photos above for direction. 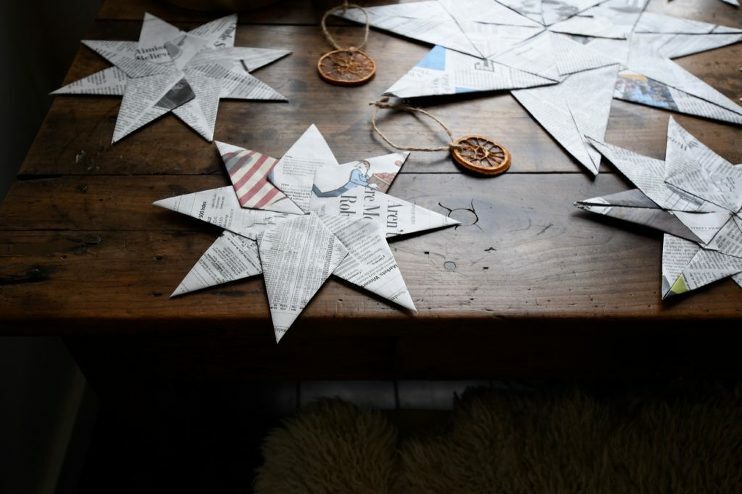 Make your star with 8 pieces of folded paper, poke a hole, and hang. While I think colorful kite paper is delightful to use as these gray days linger on, I do love the look of the classic newspaper for this craft. It’s interesting you know, all those stories of what’s going on around world, all the tales of trauma and pain and sadness, folded with loving hands, and transformed into something beautiful and magical that dances in the air. I didn’t think of it as we made them, but hanging them up I saw it all connected – beauty and pain. 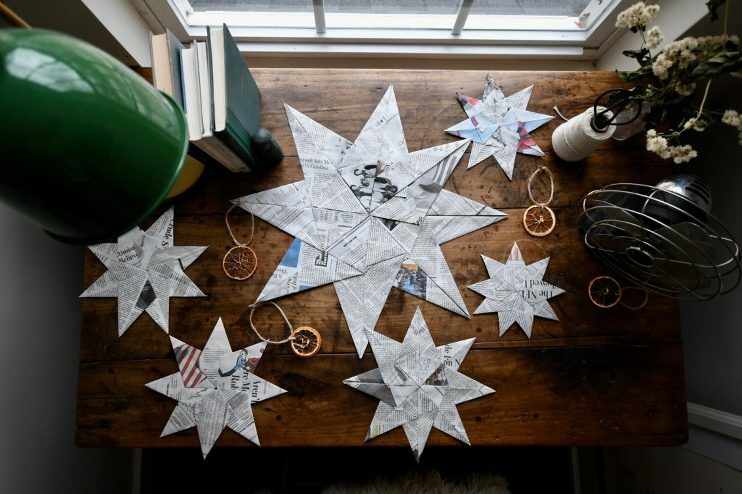 We are going to spend this week making more noel stars, some just for us, others as gift toppers, and some to share made from sheets of old books as bookmarks for friends. I hope you find some rest in your soul this week, and continue to see and savor that which lies beyond the curtain. 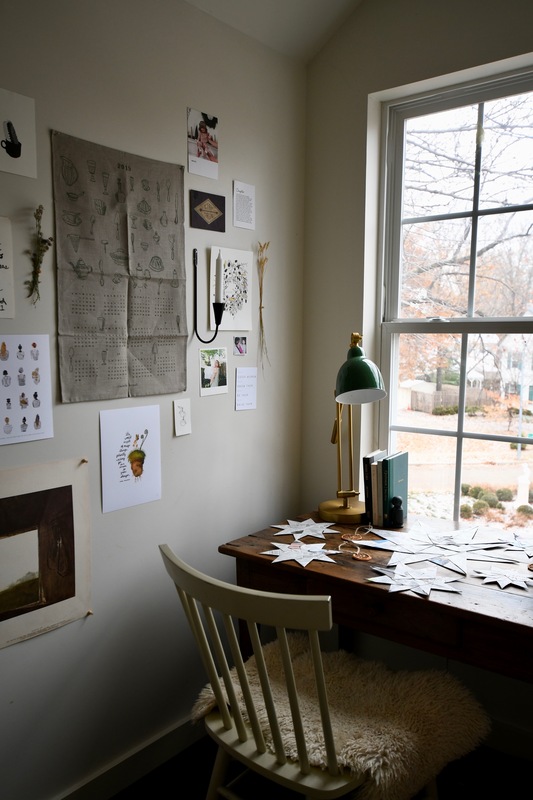 And lastly, 50 screen-free ideas to remedy cabin fever! Thank you so much for posting this star craft. I’m going to make them this weekend with my three kids.